Walt Whitman: Leaves of Grass. Leaves of Grass by Walt Whitman. With photographs by Edward Weston. Introduction by Mark Van Doren. I, xxix + 123 pages and Vol. 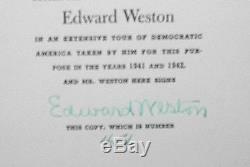 SIGNED by Edward Weston and numbered on colophon page in Volume II. Illustrated paper over boards with quarter leather spine. 50 black and white reproductions are liberally inserted throughout the famous Whitman text. Now scarce in this edition. The Limited Editions Club commissioned these photos from Edward Weston, which he took in an extensive tour of democratic. In 1941 and 1942 following the success of. During the seven month trip he and Charis Wilson took. Was getting geared up to enter the Second World War... The night before they started out, President Roosevelt made his'Unlimited Emergency Proclamation. On their journey they would often read Whitman's poems out loud to each other at night until they fell asleep, but as Charis writes,'in general (we) found Walt to grandiloquent... In truth, Edward didn't give a hoot about Leaves of Grass - he was having the time of his life. 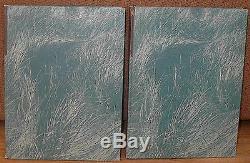 Two volume set in identical green and white sea of grass decorated boards with gilt titles on a little worn leather spine labels. Both volumes tight and square with bright clean pages. Boards show wear to the edges, corners and to spine. Scattered light foxing to a couple of pages. Few light stains to the bottom fore edge of both volumes. SIGNED and Numbered by Edward Weston. The item "SIGNED Numbered Edward Weston Leaves of Grass Limited Editions Club Walt Whitman" is in sale since Monday, January 9, 2012. This item is in the category "Books\Antiquarian & Collectible".